When I read and contemplate this verse, my mind imagining a deer. Deer is not a strong animal. A deer is always prone to attacks of wild animals such as lions or tigers. Every time its life could be at risk because there is always the target of the jungle predators. But God gave the deer tapering legs are able to bring it to jump quickly. Deer’s legs even able to jump on hard and sharp rocks to get to the top of the hill, a place where the deer will be in a much safer situation. Deer is a weak animal, but the legs are able to set foot on rocky hill, past the obstacles until finally arriving at the high and save places. I analogize a deer’s life with journey of our lives. Life in this world is not easy. Problem by problem could be making it harder to move forward, like sand, gravel and even sharp stones are tough to pass. We are weak creatures who are vulnerable to various threats. Roads are often winding and steep to through. If deer have legs that can take him jump across the stone by stone, stepped on steep streets, if we can do that as well? The Bible insists that God said we could. The Bible verse above explicitly reminds us to always be aware that the source of our strength is in the Lord, and not to the strength, or the ability of our own greatness, nor lie at all facilities, property, or the things in the world. He could make our feet like deer which able to set foot, jumping with a beautiful gracefully on the sharp stony hills. God knows our problems. He knows what we face is not easy. But do not worry God cares to us. That is why He promised help which will make us like deer, an animal that is physically quite weak but has the ability to jump over the rough terrain until he could safely reach higher ground. The hard life, stormy problems continue to hit from all directions. All that can make us waver even destroyed sooner or later. Our limited ability will never be enough to overcome the constant attacks which come upon us. That is why we need to jump over all of that and continue to climb up to the top of the hill, where we will stand upright with God who enables us. God promises a help which will make us able to leap nimbly through the obstacles by obstacles to arrive at the top of the hill safely. My dear lovely readers, whether our lives are being hit by so many storms? Problem by problem hit us from every side? Our feet are too weak to jump on the hard and sharp stones? Hard to climb up to the higher safe place? Let’s ponder again the Bible verse above. “The Sovereign Lord is my strength” This phrase means do not rely on our own strength when we face the problem. Rely on ourselves or other things in this world sooner or later will make us give up.” he makes my feet like the feet of a deer, he enables me to tread on the heights.” Do not forget that we have a God who so loves us and has promised us help. He is ready to give the deer leg that will enable us to traverse the rocky road, winding and steep until finally standing upright on top of the hill, where the problems are no longer able to bother us. Amen. Amen! We do indeed have a loving God who does give us strength and help in times of need, Well done Karina! Amen! Dear Grandma Elaine, Thank you so much for your lovely comment. Many love and blessings on your day. Amen! May God continue to bless you. Amen! Luis, Thank you so much. Blessings. Thanks for this very needed post. God lifts us up and helps us over any difficulty. Blessed be His name! Thank you so much. I am glad you love it. By the way how are you. You are welcome, my dear friend. Blessing on your evening. Karina, you are so right. Much of our struggles come when we try to be independent, try to do it ourselves, forgetting that our God is there to lift us up, forgetting that He has the Power and Strength and point of view from the mountain top to see all the road blocks ahead. Our Creator made us perfectly to rely on Him, exactly like the deer you describe so elegantly. Thank you so much for your lovely comment 🙂 I will consider to add your comment into my paragraph later. Once again thank you. Blessings. Reblogged this on Sarah's Voice. Thank you so much for your kind comment. I really appreciate it 🙂 many blessings. Amen! Thank you for your lovely comment 🙂 oh by the way your Ym wasn’t active? Sis, I love the analogy you draw here. It makes me love God all the more for creating us in this way that we travel the rocky places in our lives. He’s there to guide us too. I love this post Karina! Thank you so much,Grandma 🙂 will pray for you and Larry too. ♥ you too. Habakkuk 3: 17-19 is one of my favorite passages in the Bible. Dear sister in Christ, Anna. Same with me 🙂 Thank you very much for reading my old post. I really appreciate it. Many love and blessings to you. Yes we have a strong God who is able to help us in any troublesome time if we but ask for His help. A good post, sis! Thank you so much, my godly brother 🙂 Blessings. And thank you for all that you share with me and all of your readers. I am a regular reader and friend of yours as I trust you know, sis! Thank you very much for your great comment on my old post,sis. Amen! May God bless you abundantly too :). Thank you very much for your comment on my post 🙂 God Bless. May I use this on my blog as a guest list? The peace, wisdom and strength of these verses have always encouraged me . My favorite word in the entire book is YET will I rejoice in The Lord my Savior. No matter what circumstances we find ourselves in, YET we can rejoice, for He is with us. First of all, thank you very much for visiting my blog also reading one of my old post..Yes you definitely use my post as guest list on your blog. It was such a great honor to me..Thank you and God Bless. Amen! Thank you very much for your lovely and heartwarming comment. Send my warm regards to Uncle Wyman. God Bless both of you in Hawaii. He has revealed Himself to us! Thank you very much for you comment 🙂 God Bless. You are welcome 🙂 Thank you for reading my old post. God Bless. You are welcome 🙂 Thank you and God Bless. This is beautiful!! I’m saving it so I can read it again, later! I need to meditate more on those passages. Thank you very much, brother 🙂 Hopefully my post could be useful and be a blessing to you and others. Thank you and God Bless. 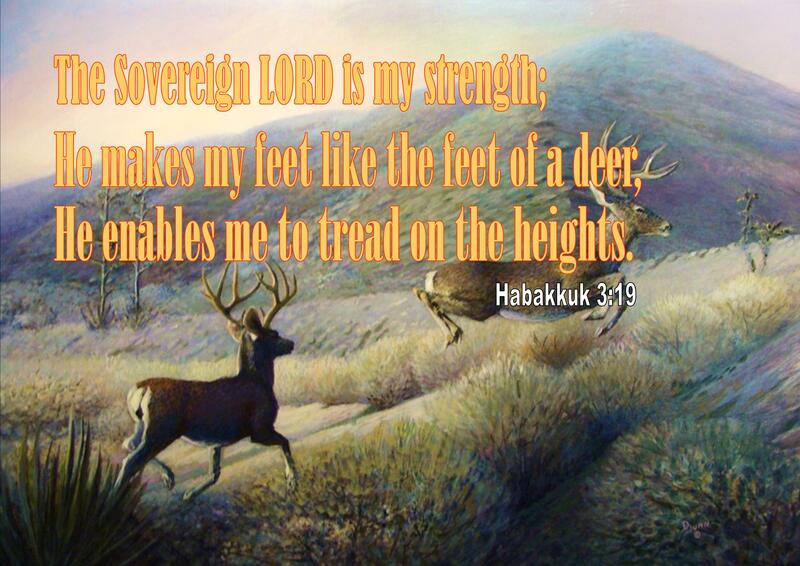 Habakkuk 3 is one of the most memorable passages. Major Bible theme. In wrath remember mercy. Reference to the hiding away of the righteous while terrible judgment is exhausted. Then the supreme test of faith. Though all gifts are not forthcoming I still believe in the Giver. He equips me for all sorts of paths in life. And the high precarious trails can be beautiful. Thanks for your like of my post, “Consider The Jews;” you are very kind. You are welcome 🙂 Thank you for you lovely comment on my post. God Bless. Very good post. (didn’t see a “like” button, so thought I’d just comment.)Blessings. Thank you very much for reading my old post 🙂 Merry Christmas and Happy New year ahead. God Bless. Lord plant my feet on solid ground. Beautiful post. Thank you very much for reading my old post 🙂 God Bless. Your thoughts are beautifully expressed. Thank you Karina Amen! That’s a good word and thought to remember. I am new to doing a blog but what I like most is sharing God from the view of my heart and reading others view of God from their heart. Thank you very much for your Bible verses. Welcome to the WordPress. Thank you for visiting and reading post. God Bless. You are welcome. Thank you for visiting and reading my post. I really appreciate it. Have blessed day.